Chuckit! 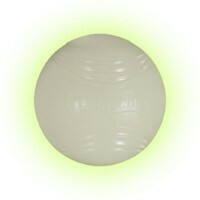 Max Glow Ball is great for fun indoors, outdoors and even in the dark! With a light hollow construction this ball is ideal for dogs who love a good chase while playing fetch. Designed from luminescent soft rubber this durable ball is easy to clean with a great bounce! Perfect for dark winter walks - no worries about batteries or breakage, it only takes ten minutes or so under a strong light source to 'charge' it up. It's robust enough to stand up to the jaws of my large-ish crossbreed (during supervised play). Plus the holes mean I can thread a rope through which makes it easier to throw and allows for tug games.